Vintage Honda Shop Tools. Carb Sync Gauges. Topic: Vintage Honda Shop Tools. 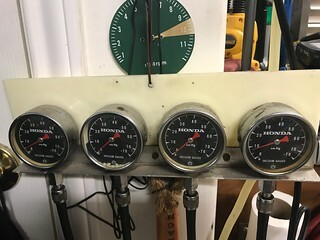 Carb Sync Gauges. Here’s a cool set I bought a while ago. Just like the pictures in my 70’s Manuals. They were covered in crud, but I couldn’t resist. Spent quite a while dismantling, cleaning, and polishing. Worth it! Probably 50 years old and still working well. New set of hoses and hopefully my son will still be using them in 2070! Anyone have a 6 X CBX one of these? Re: Vintage Honda Shop Tools. Carb Sync Gauges. Nice. Nothing quite like clean shiny tools. STEVE-O....... Mine were so dirty I barely spotted the Honda logo! Plastic headlight polish worked well on the lenses.